An SBG Exclusive hand made from start to finish in the USA by Chris Palmer from Scorpion Swords in Springfield, Missouri - the sword was designed for usage under extreme conditions by Paul Southren, owner and chief editor of Sword Buyers Guide and is based on a Japanese Ko Katana designed primarily for cutting, but can also deliver devastatingly effective thrusts. 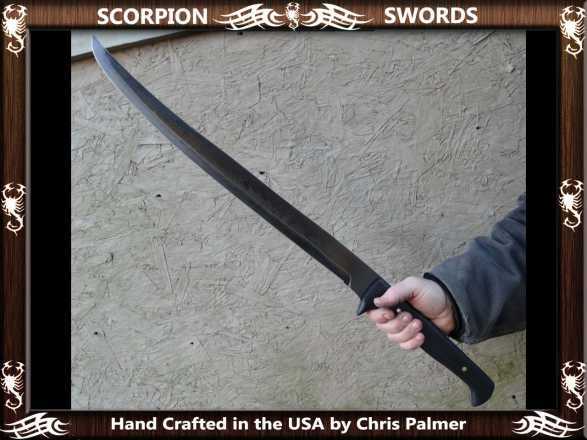 The blade itself is made from 1095 carbon steel, which when combined with Chris's superior heat treatment process results in an EXTREMELY DURABLE and almost indestructible sword. The blade is heated to approximately 1500 degrees, until it becomes non magnetic and then quenched in oil. The 2nd step is Heat Tempering, which consists of heating the steel to 500 degrees for 2 hours, and letting it air cool. This makes for a Rockwell Hardness of approximately 59. 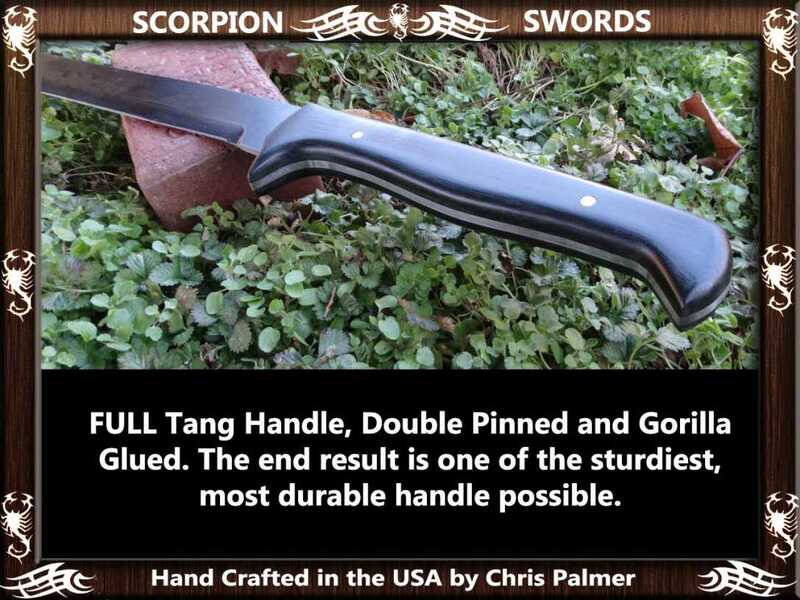 Truly FULL tang, the Black Linen Mircarta handle is affixed in place with hidden and visible pins and gorilla glue resulting in the strongest handle construction possible. Combined with the tough blade and you have a sword with no weak points that maximizes its durability. 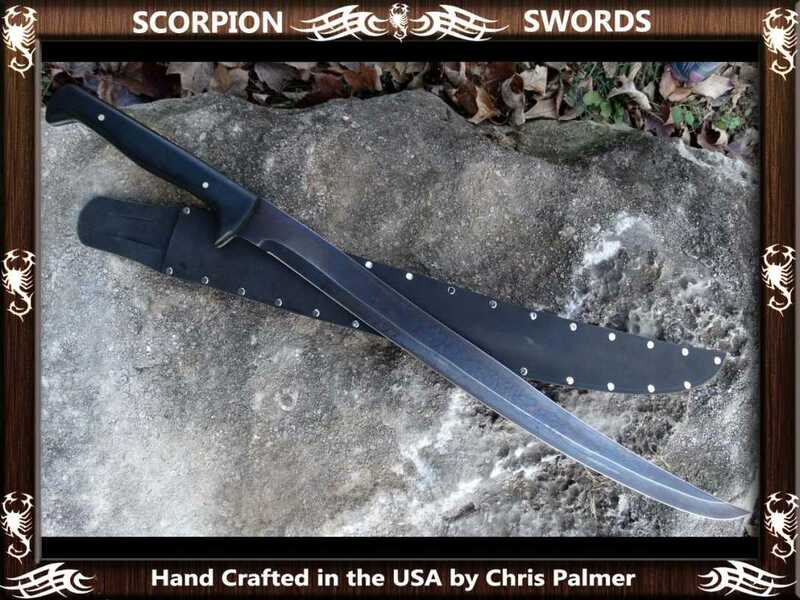 Unlike most other swords at this price point, Scorpion Swords are individually hand made by Chris Palmer at his workshop in Missouri. All orders are handmade in our shop as orders are received. They are NOT Factory Made! High order volume makes it difficult to keep any of their weapons in stock, so please allow 6-8 weeks for completion and delivery. Designed for frequent abusive cutting. In case of Zombie outbreak, break glass..
Hand made in the USA from Blued 1095 Spring Steel. Superior Heat treat process. Thermo composite Black Linen Micarta weather resistant full tang handle. Leather Sheathe (optional upgrade). 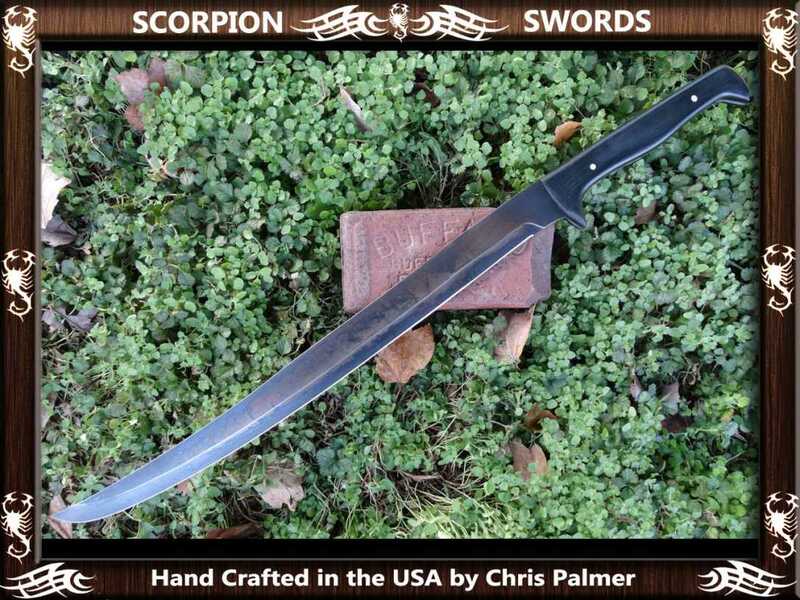 $15 shipping anywhere in the Continental USA from the Scorpion Swords Workshop in Springfield, Missouri. $30 Shipping to Canada, $60 to anywhere else in the world. Made to Order, please allow 6-8 weeks for completion and delivery. I purchased this sword because I wanted a quality no frills sword I could use for training, defense and fun. This sword does not leave me wanting. This is a utilitarian piece that will survive you. Everything fits perfectly and itâ€™s well balanced. 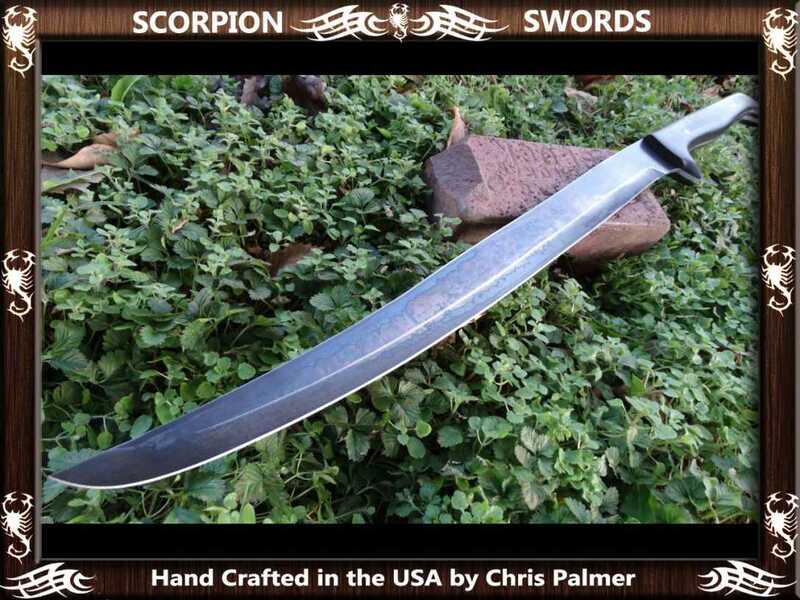 I purchased this sword thinking the blade length would allow me to draw from the back if the situation dictates. It does so wonderfully. 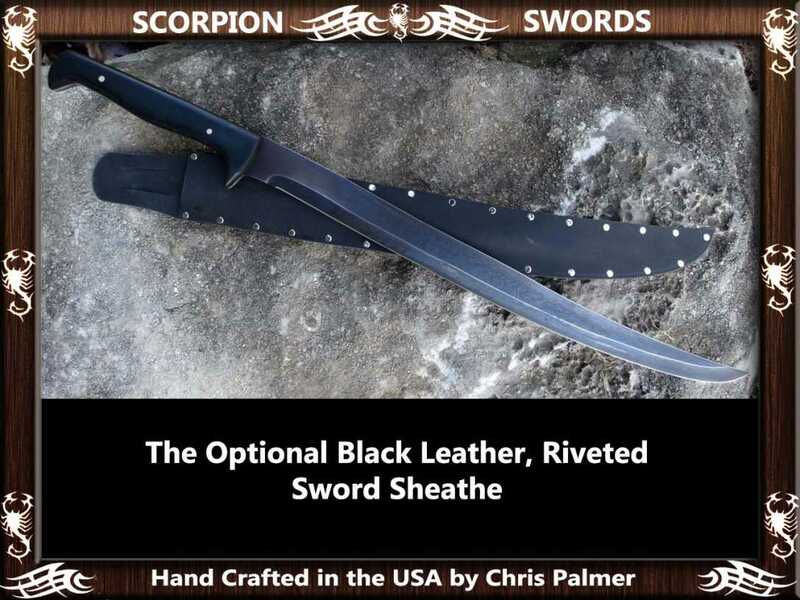 The optional leather sheath is riveted and made of a heavy leather. It sits well on the belt but I use a baldric so it sits higher. If you decide to purchase this piece forged by a true craftsman you will not be disappointed. I have zero buyers remorse. I will be purchasing more weapons from this artist.